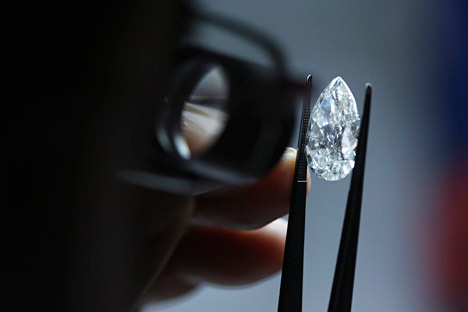 India plans to ease regulations for Russian diamond traders. India plans to ease regulations for Russian diamond traders to supply rough diamonds to India’s polishing hubs. India will soon be enacting regulations that will end the role of intermediaries in the import of rough diamonds from Russia. Sources from the Indian Ministry of Commerce told Sputnik that new regulations will relax the restrictive taxation and customs procedure which Indians had to adhere to when importing rough diamonds. A discussion on this is expected to take place between Indian Prime Minister Narendra Modi and Russian President Vladimir Putin when the two meet in Goa this weekend ahead of the BRICS summit. In 2015, India created a special customs zone in the Bharat Diamond Bourse in Mumbai in order to facilitate the direct supply of diamonds from Russia. India is attempting to further develop the zone in order to upgrade its rough diamond auctioning mechanism. Russia is the world’s largest producer of rough diamonds and exports diamonds worth 4.24 billion USD per annum. Meanwhile, India is world’s largest diamond polishing hub.